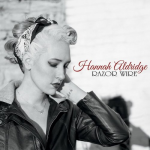 A lot of the time Hannah Aldridge has the sound of a feistier Stevie Nicks, that breathy drawl with just a touch of wonderment, but she has a real gritty edge to her music that Ms Nicks doesn’t quite hit. Musically she sits in a place that some call ‘Dark Americana’ and it covers her songs about the dark side pretty well. Old Ghost for example has a haunting country feel backed up with a great Hammond underpinning from Derry DeBorja (part of Jason Isbells 400 band). The songs are strong with great melody and the playing matches but you are here for the subjects and the picture of Ms Aldridge on the back cover smoking a cigarette and very noir sums it all up pretty well. You aren’t getting supernatural takes or horror stories – the darkness is all about the human soul. Her Nashville and Muscle Shoals origins are clear here and she draws on experience of her father who was a legendary songwriter, performer and producer and the experiences of the musicians she grew up listening to and learning from but she has created a character of her own and it is that creation you are listening to. To some this is going to be a little too country and not enough Blues but she is singing about real people and the depths of their emotions and experiences and deserves a place in a Blues magazine on that basis. The title track is so dark and deep that you cannot help but be drawn in to her emotions but her version of Howling Bones is the real standout for me – chilling and so bleak you will be shivering well after the track has finished.